The Omega Nutrition Center Doesn’t Just Juice! Hey, let me fill you in on a little secret! The Omega J8004 Nutrition Center Commercial Masticating Juicer is very similar to its younger brother, the Omega J8005 Nutrition Center Single-Gear Commercial Masticating Juicer. How do you know which one to buy? There are a couple of key differences you’ll need to take into consideration before deciding which to purchase, so let’s focus on the wonderful aspects of the J8004 in this juicer review. a more modern looking chrome version. This version has a built in handle, which makes it easy to transport around without being too clunky. The on/off switch is also located in the back of the machine, which keeps it far away from any juice splatter that may occur during the process. 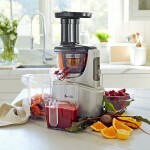 The opening of the J8004 is larger, which means that you can throw in large chunks of fruits and vegetables without needing to chop everything up into smaller pieces before juicing. This cuts down on a lot of prep time, which is helpful for those of us with busy lives! Both the pulp container and the juice container are larger on the J8004 model, which is especially helpful for those with larger families or social gatherings. If you constantly have people over at your house, do you really want to have to continuously empty the juice and pulp container while trying to produce juice for everyone? If you’ve ever had to deal with a juice overflow, you’ll be happy for the bigger container (trust me, it’s not fun to clean up). 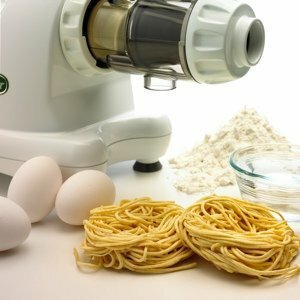 Ah, the wonderful power of versatile kitchen appliances. Need to mince some herbs or garlic? This machine can do that. Just realized you don’t have anything to grind your coffee beans with? It’s okay, this machine can do that too! Just ran out of peanut butter but have a ton of peanuts? 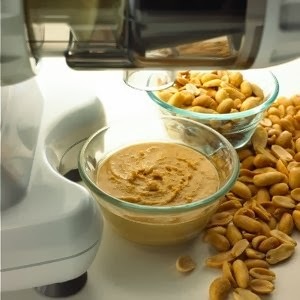 Throw them in and watch them turn into peanut butter before your eyes. Seriously, this machine is wonderful. Instead of owning ten different appliances, this machine takes them all and turns them into one super-machine. It saves you space, it saves you money, and it saves you the time you’d spend looking for all of these appliances! Because this machine is a masticating juicer, it extracts juice at a low speed. This retains nutrients and enzymes found naturally in your vegetables and fruits, and helps your juice stay fresh for longer (up to 72 hours in the refrigerator!). 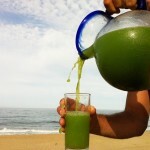 Many other juicers on the market produce juice that doesn’t taste as fresh after this period of time. 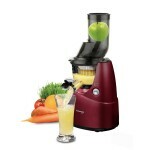 Since this juicer offers a two-step juicing process, the juice is first extracted from your ingredients and then the pulp is pressed to get the last remaining liquid out of it before expelling the pulp into its container. This ensures that you’re getting the most out of every ingredient you feed through the chute. It has a nice, clean appearance, separates easily for simple cleanup, and I can make a large jar of juice Sunday morning and save it for the next three days! This reduces the amount of prep and cleanup I have to deal with on a daily basis, which is extremely helpful with my busy schedule. If you’re looking for an easy way to produce fresh juice while also being able to create soy milk, nut butters and grind coffee, the Omega J8004 Nutrition Center Commercial Masticating Juicer is perfect for you. I love the fact the manufacturer really does stand behind this Juicer with a 15 Year Warranty – the longest in the Industry – guarantees you’ve purchased “the last juicer you will ever need to own. 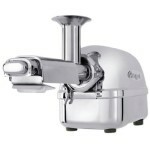 Heavy Duty Juicer with Multiple Uses : The Omega J8004 Nutrition Center Commercial Masticating Juicer is a versatile machine for the home kitchen or commercial use. New More Durable Auger – GE’s ULTEM material results in an auger 8 times stronger than others. 15 Year Warranty – The longest in the industry guarantees a confident purchase. Low Speed 80 RPMs – Ensures full taste and high nutritional values. 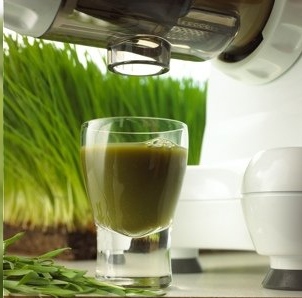 Powerful motor chews the plant fibers and penetrates membranes to extract vita- mins, enzymes, and minerals. 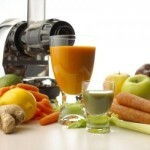 Continuous Juicing – Automatically ejects pulp into a pulp container that allows for continuous juicing. Quality Engineering – Heavy-duty construction using the highest quality materials equates to a juicer that is engineered to last a lifetime. Built in Reverse – The built in reverse prevents clogging.